It may be that Kildare's most endearing trait is their slow-revealing, collective self-awareness. "That word 'potential' has been thrown around a lot with us," Feely said, sounding like someone who has heard a word so often, it has lost its original meaning. "A quote that one of our selectors, Padraig Brennan, said to us is that potential is not playing very well a lot of the time. And that sums us up nicely." "I think physically and talent wise there's massive potential but that only comes to fruition if you make good decisions and manage the game well. "And I think in the last two games that's where we've grown as a team, in that we're not doing ridiculous things on the ball that we were maybe doing in the league in terms of taking shots from outside the scoring zone or trying passes through the eye of a needle or taking the ball into contact in the centre of the pitch, which are all the things that were letting us down in the league." "But," Feely added, "what's separated us from the better teams is that we don't make good decisions. We don't manage the game well." Inconsistent is another almost universally-used word by way of attempting to define Kildare of late but 'unpredictable' is probably more accurate. What can be more consistent than losing 12 games in a row? Last year, having steadily built to a decent showing against Dublin in the Leinster final, they lost to Armagh when all known form pointed to a Kildare win. Inexplicably, that was the first of a dozen losses. Then, six weeks ago, after that shocker in Tullamore against Carlow, the most obvious thing for Kildare to do was to slump quietly out of the Championship before they did any more damage to their own reputation. Yet here they are, one of the elite, in the form of their lives and with Mayo stuffed and mounted on the mantelpiece in Newbridge. "Last year we let ourselves down in that respect," Feely admitted in another fine display of self-awareness. "Having a good Leinster campaign and then in the Armagh (game) taking our eye off the ball, if you like. "Probably, we got ahead of ourselves. "For that reason I think this week we were very tense, very keen not to let the elation of last week go to our heads but at the same time bringing through that positivity that we had last week." 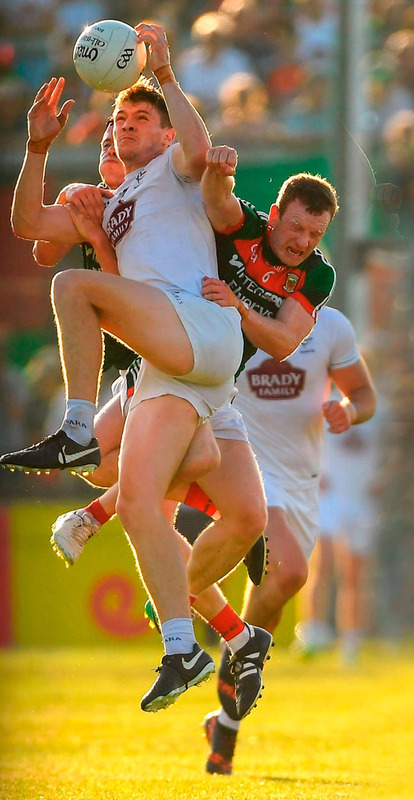 Just a week previous, Kildare's victorious players stood on the pitch where they had fought so hard to beat Mayo and calmly asserted that great and all as the win was, there was another, bigger win to plot in just seven days. "The mood in the camp this week was ridiculously tense because of what was on the line," Feely acknowledged. "After the elation of last Saturday wore off, it was very much a case of, 'Jeez, we've been in this position before', where we've had a big win and the next week or a couple of weeks later we've let ourselves down completely. "I think there's definitely a sense of being able to breathe out a little after this game, yeah," he insisted, having continued his dual brief of kick-out catcher/sporadic full-forward for the 46 minutes he played against Fermanagh on Saturday evening. "Definitely relief is the overwhelming emotion. 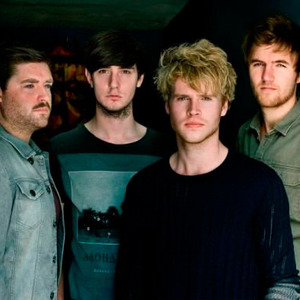 "I think the tension will be gone but there'll still be a massive focus. "We're going to be underdogs going into every single game we play in the Super 8s. "In terms of tension, yeah, that will be gone but we'll still have an awful lot to prove. "We haven't really proved anything yet, based on our league form. So going into the Super 8s against top opposition we're going to have to show that we can consistently match them." The portents are good. On Saturday night, Kildare were tactically immense. Mark Donnell's kick-outs were varied, accurate and thus successful in all but three instances. Their big men around the middle didn't only win ball but added to an attack that need extra bodies to occupy all of Fermanagh's defenders - Tommy Moolick's brilliant bat-down for Neil Flynn's goal being the most effective example. And for a county with a reputation for wastefulness in front of goal, they kicked 1-13 from 16 shots in the first half and finished with just four wides. 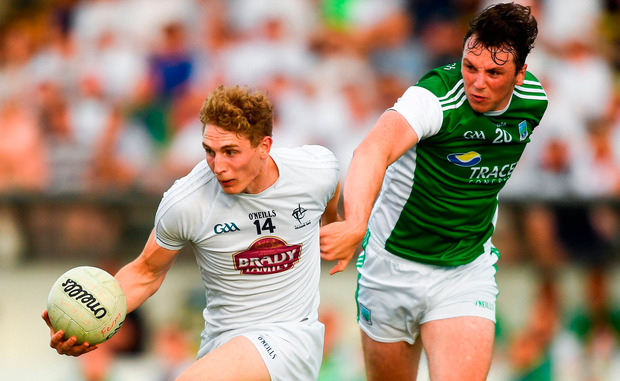 It wasn't, therefore, that any single component of Kildare's play has improved spectacularly in the past six weeks, it's that almost all of them have. "We've put a real emphasis on trying to give each other energy from the good things that we do," Feely outlined. "More encouragement instead of just focusing on negatives and getting onto each other for negative things. "When people are doing things well we're trying to give each other energy for that. "That's happened a lot in the last few games where someone's done something good, they have been told they're doing something good and everyone gets energy from that. "Then I also think that the work-rate off the ball has just gone through the roof since the game against Carlow in terms of putting pressure on opposition teams in the middle third. "From what the backs have told us, they're getting huge energy from seeing us out the field putting in a massive work rate and trying to turn over lads in the right areas of the pitch. "And," Feely added, "I suppose yeah, we were hopping off the top of the ground in that respect."